Is there hope for California's salmon? A “Save California’s Coho Salmon” campaign is currently underway in Marin. The county’s Lagunitas Creek Watershed is one of the most important waterways left for wild coho salmon. Photo courtesy of the Turtle Island Restoration Network. For more than 14,000 years, humans have had a close relationship with wild salmon. Along the Pacific Coast, natives harvested thousands of adult salmon each fall from their spawning grounds in local rivers and streams, a catch that fed their families throughout the year. Salmon’s legacy for Californians goes far beyond its estimated $1.4 billion fishery or its classification as one of the most nutritious foods in the world: The fish also provide a vital transfer of nutrients and energy from the ocean back to the freshwater ecosystems where they were born. “People have done studies to show that you can identify ocean-derived nutrients from salmon in many dozens of different species, like kingfishers or water ouzels, fish-eating ducks, foxes, raccoons, coyotes—all the way up to the big predators that used to live here but are gone, like grizzly bears,” says Nate Mantua, a research scientist for the National Oceanic and Atmospheric Administration’s (NOAA) Southwest Fisheries Science Center in Santa Cruz. Accumulating 95 percent of their biomass at sea, adult Pacific salmon die after they spawn, and their nutrient-rich carcasses, gametes (mature eggs and sperm) and metabolical waste return to the land. “It’s fascinating that, over the eons, a lot of fertilizer was provided by these dead salmon, so a lot of the wine grapes and a lot of the agriculture inland by the rivers was fertilized by salmon for a long time,” says Randy Repass of the Golden Gate Salmon Association (GGSA), a coalition of salmon advocates based in Petaluma. Salmon’s yearly return props up an entire food web, replenishing bacteria and algae, bugs and small fish, and fueling plant growth with deposits of nitrogen and phosphorus. Not part of the aforementioned $1.4 billion fishery, but a big concern in Marin County, are the struggling coho salmon, a species of Pacific salmon that are illegal to eat. The number of endangered coho salmon in Marin might be up this year—269 ‘nests’—but that number doesn’t mean anything without context and an appreciation of the historical baseline, says Todd Steiner, founder and executive director of the Turtle Island Restoration Network in Olema. The organization’s Salmon Protection and Watershed Network (SPAWN) is trying to save the coho from outright extinction in California. A few years ago, the returning coho numbered 250, Steiner says, but a fully recovered fishery would see some 2,600 adult fish a year returning to Marin creeks to spawn, for a decade. But even that won’t get you to the true historical baseline of the fish, given that about half of the salmon’s habitat in Marin County has been destroyed, Steiner says—and continues to be destroyed, especially in the San Geronimo Valley. Whereas the fight over saving the salmon in other parts of the drought-stricken state often comes down to agriculture issues versus piscine ones—save the steelheads or water the almonds?—in Marin County, the issue is whether the coho can prevail over new-home development in San Geronimo Valley and West Marin. The Chinook (aka king), the largest salmon species (adults often exceed 40 pounds and are capable of growing to 120 pounds), is the pride and joy of California’s salmon fishery. Not so long ago, the Central Valley watershed was one of the biggest producers of naturally breeding Chinook salmon in the world, second only to the Columbia River, with the Klamath River another big California contributor. Driven by the Sacramento and San Joaquin river systems, the Central Valley nursed a ballpark average of a few million salmon per year, emerging each spring out of the Sacramento-San Joaquin Delta, says Mantua. 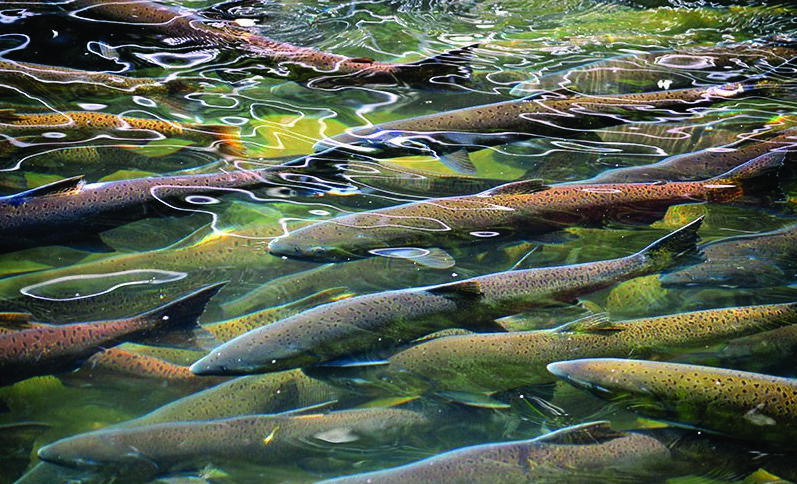 In addition to cold ocean water and an ample food supply at sea, salmon require cold river water that drains all the way to the sea, and, during their early life, a delta habitat. Salmon eggs do not survive in water warmer than 56 degrees, which is why adult fish ready to spawn instinctively head toward the cold, upper headwaters and tributaries coming out of the snow-packed mountains. Development in the 1940s through ’60s, and especially the constructions of dams like the Shasta Dam, built in 1943 on the Sacramento River, played a key role in the near annihilation of the long-standing fish stock. “When they built the big dams in California, they basically blocked off access to 80 or 90 percent of the habitat salmon historically used to reproduce in California,” says John McManus, executive director of the GGSA. California’s four salmon runs—fall, late fall, winter and spring—are named for the time of year the fish return from the open ocean as adults, after about two to five years spent feasting on smaller fish and krill at sea, and back under the Golden Gate Bridge to the Sacramento-San Joaquin Delta. As of 1989, the winter run had joined the ranks of 130 other endangered and threatened marine species when it was listed as an endangered species under the Federal Endangered Species Act. Ten years later, the spring run was listed as threatened. In addition to cold ocean water and an ample food supply at sea, salmon require cold river water that drains all the way to the sea, and, during their early life, a delta habitat. Following a period of abundance in the late ’80s, and then again in the late ’90s and early 2000s, California’s salmon season was closed in 2008 and 2009, resulting from a population crash that NOAA scientists found was due to a lack of upwelling and the subsequent low production of krill, one of salmon’s dietary staples. “The population has undergone a modest rebound since then, but it still has not reached the abundance that we observed in the late ’90s and early 2000s,” says Michael O’Farrell, a research fish biologist at the NOAA. While there has been an increase in small sardines, a potential good sign for salmon, Greg Ambiel, who has been fishing salmon locally for 30 years, is not hedging any bets for this coming season. Indeed, over the last few years, a fairly drastic shift has occurred, with high-profit almond crops replacing raisin grapes and other less profitable crops in the Central Valley. The problem for salmon is that it takes a gallon of water to produce one almond—which is three times more water than it takes to produce a grape—according to a study published in 2011 at the University of Twente in the Netherlands. Water demands for agriculture are a known contributor to an estimated 95 percent loss of salmon’s critical rearing ground in the Sacramento-San Joaquin Delta. Last month, O’Farrell began the process of calculating 2016 abundance forecasts for both the Sacramento and Klamath rivers and tributaries, based on data that includes the return of fish the previous fall. Each March, he reports the number to the Pacific Fishery Management Council, who then sets the season in April. The Central Valley Project Improvement Act, passed in 1992, ambitiously hoped to double the number of salmon and steelhead trout in the Sacramento River basin over the past 22 years, but it has fallen short. While their goal was to see 86,000 spring-run Chinook salmon spawning in the Central Valley by 2012, the number was only 30,522. Federal officials cited obstacles such as drought, competing demands for water and lack of funding. But Steve Lindley, leader of the Fisheries Ecology Division at the NOAA, points to wetland restoration success stories in the Central Valley, in places like Clear Creek and Butte Creek. Tom Gogola contributed to this article. Until the dumping of industrial fluoride into the Sacramento River is halted, salmon populations will always be debitated. Just ask the University if Oregon OR Brent Foster for what happened on the Columbia River. Salmon are narcotized by miniscule levels of fluoride in fresh water. The 1 ppm levels in Salt water buffered with massive levels of calcium are not toxic. Industrial synthetic fluorides used in water fluoridation are all listed toxics. First, there was only one finding ( by the judge) against the county, the county won on all the other points. As part of the order the county was required to perform a study – at an estimated cost of about $250, 000. The study was to determine what the effects of “total buildout” of San Geronimo Valley would entail and it’s effect upon the salmon. The interesting thing is, the county argued in the case that, effectively speaking – SGV was already ( more or less ) at total buildout and that the study was superfluous. And this point is really interesting because the thing about these types of studies is that invariably, the study performed typically reflects the opinions/desires of the folks paying for them. And this isn’t surprising. These folks know which side their bread is buttered on so it’s very unlikely that this court ordered study will show anything different than what the county argued in court. Additionally, Mr. Steiner’s lawsuit cost the public tax payers over $650,000. Not one dime of that legal fee went to put one twig of habitat restoration into place. Further, the article gave the impression that no creekside ordinance was in place. Not true, the county had not only adopted a stream side ordinance, but a building moratorium was also in place but under the proviso that if suit was filed against the county, the ordinance would be vacated along with the building ordinance. Try as he might, Mr. Steiner couldn’t resist the fight. Finally, Mr. Steiner is convinced that creekside is everything to the fish. I’m not saying it isn’t important but the simple truth of the matter is that the spawning numbers are no better than they were before all the “heroic” efforts of Mr. Steiner (and his ilk) started making those improvements decades earlier. There are a couple of items completely out of Mr. Steiner’s hands, that all the creekside habitat improvements have already shown, have no effect upon. 1. A warming ocean. Salmon are cold water fish, and along with seals, otters and many other cold water fishery inhabitants, are starving and dying like never before. You can build the “Faremont” of creekside improvements in the SGV and while it may aid the few fish that come into spawn, they’re not surviving out in the ocean in sufficient numbers to take advantage of the improvements that mr. STeiner and company have made. And Mr. Steiner never acknowledges that fact. Further, look at the redwood creek in Muir woods. There is virtually no development on that creek what so ever and that is along that creek throughout it’s entire run. In Fact the Park service just spent 10’s of millions of dollars in improvements in the muir beach parking area and that entire estuary. As far as I know, there wasn’t a single fish seen to spawn in Redwood creek this year as well as in recent years past, and there were in the past ( I saw them, I promise). One of the other factors ( and excuse me for mangling this but) there is also the pacific decadenal oscilation which was noted in a report developed by the national parkservice where they studied the correlations between spawning and ocean temps and ocean upwelling. When the upwelling, diminished, the salmon population crashed irrespective of creekside improvements. The bottom line is, that with respect to Mr. Steiners messianic vision, his ability to reach into the public coffers, accountable to no one, from my humble perspective it appears that the emperor has no clothes. The simple fact(s) of the matter that after decades of “improvements” the salmon population is no better than it was back in the days where there were absolutely no imrpovements what so ever. I wouldn’t complain if Mr. Steiner was using private monies to accomplish his mission, or for that matter, public monies as well. As long as funding for such went through appropriate public channels where public support could be gauged, shaped and mobilized. And, more importantly, the democratic process was respected. But Mr. Steiner will have none of that. Mr. Steiner resorted to the courts. He appears to have no interest in genuine public dialog and debate and why should he, he won on one single nebulous point. And that point won him a hefty payday. And you know, if I was in his position – I would probably do the same. Someone’s gotta put food on the table and it might as well be me. Salmon anyone? Thank you for a good Article. We spent Earth Day there and I used to live in Fairfax in the ’70s. Glad to see development being slowed. The people of Marin have done a good job of maintaining the outdoors in spite of our rapidly growing populations in the Bay Area. I find myself spending more time in the west county area and on Mount Tam. I hope to relocate back to the Fairfax area . I’m retired now and looking into what I want to get involved with. Change comes by acting locally. Living the changes you want. Giving a good example to others. Do this and we can change the world. One person at a time. Peace from an old Fisherman.